Good morning everyone. Spring is theoretically here although the other day we awoke to a very thin white blanket of “poor mans fertilizer”. 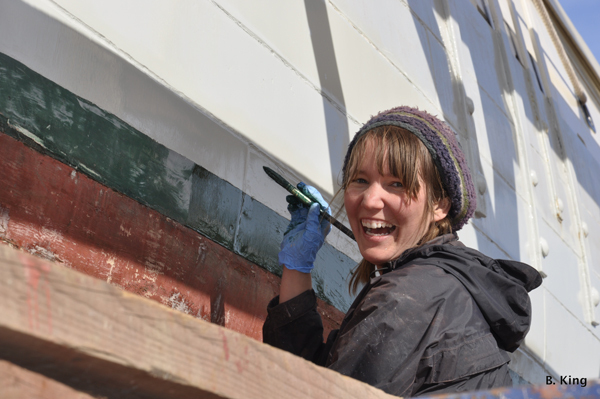 Believe it or not the temperatures did rebound clear up into the 40s; good enough for painting aboard the schooner. I am so impressed with the crew and how hard they have been working. They took a day off yesterday. The forecast for tomorrow looks promising for pushing more paint. As excited as I get about painting the schooner, I really enjoy a morning walk in the woods with the dogs; a grand tour of nature awakening in spring. 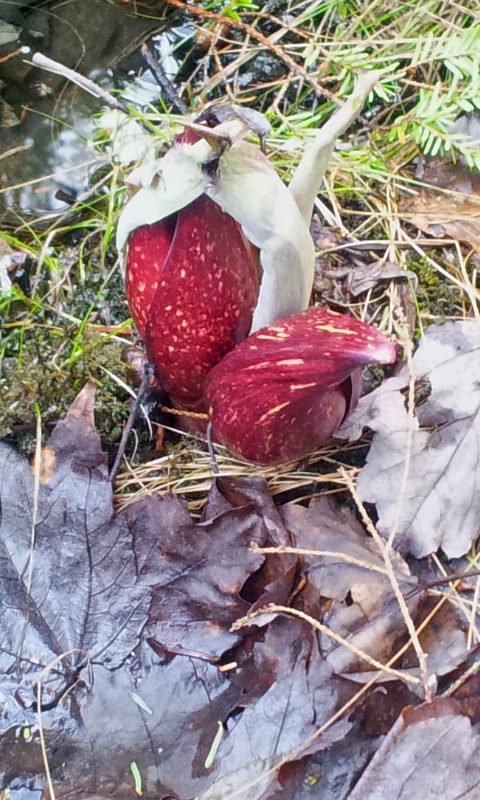 The first flowering plant of the year is present in the swamp. Its brilliant red flower covers poking up through the snow and ice due to its very unique ability to generate heat. Do you know what it is? The familiar call of spring peepers can be heard in the early evenings and this morning I heard a hermit thrush. The song of the hermit thrush is soul food. 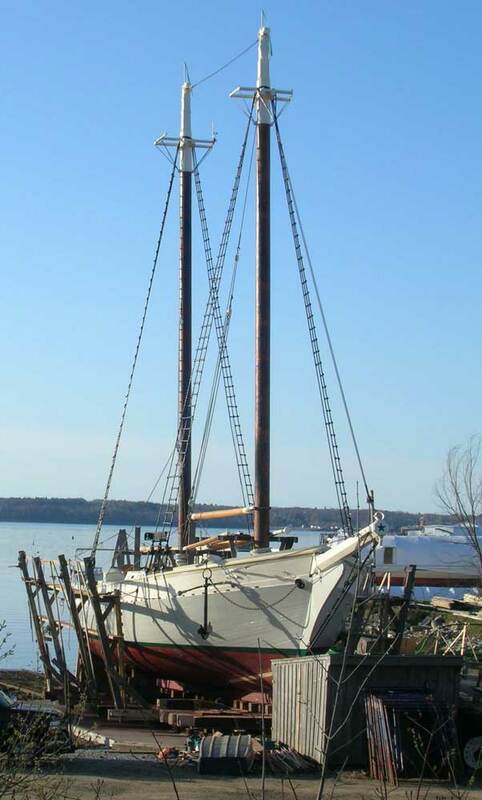 Other sure signs of spring, the cover came off the schooner on Thursday. Wow! Daylight and fresh air at last. We are waiting for the call from the shipyard. This is obviously a big time of year and the yard period is always the busiest. So if you happen to be in Rockland, Maine next week stop on by. We won’t really have any time to talk but I guarantee we’ll put a scraper and putty knife in your hands and put you to work. Posted in camden windjammer cruises sailing vacations and tagged camden windjammer cruises sailing vacations, maine sailing vacations, maine windjammer, maine windjammers, signs of spring in Maine, windjammer vacations on April 20, 2013 by Capt. Barry. Good morning everyone. Do you know any characters, folks who you just can’t forget? 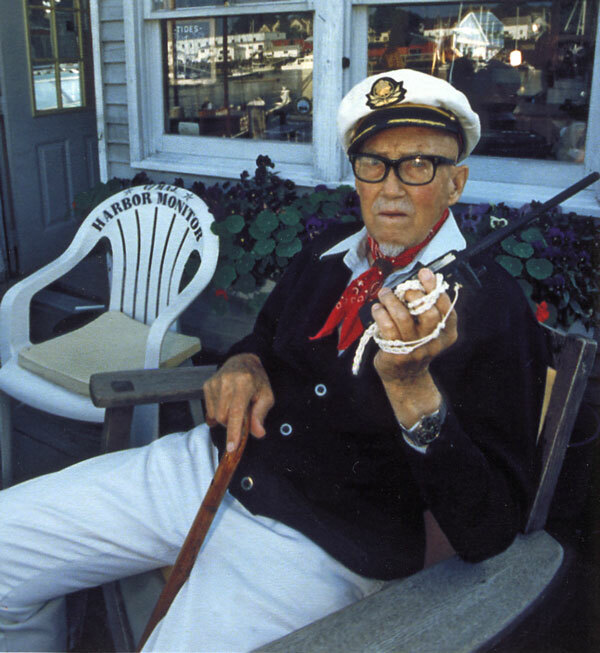 Let’s see, a few characters that I will never forget: Major Floyd S Chadwick, USAF Ret., our dearly beloved Camden “Harbor Monitor” Now that man had a quip for everything and I must use a “majorism”, one of his often used witty explanations for life, everyday. Then there is Mary, Sweet Mary, who learned her baking craft from Josephine Day who ran the Trailing Ewe for many, many years before she called it quits at somewhere close to the age of 90. Mary learned how to do a days work in her 25 summers at the Ewe. Mary could do anything in the world without complaining and with a smile on her face. Everyone felt warmed by Mary’s goodness just by standing in the same room with her. My Dad had his moments, walking into the local yacht club like he owned the place. I didn’t find out until I was an adult that we used the launch service for years without actually possessing a membership card. Not a very good role model but he had a certain nerve you kinda had to admire and probably helped him stride confidently (wether he was confident or not) into many difficult situations. And then there is Bruce, as honest as the day is long, as forgiving as the clouds are high and as full of funny stories that redefine the word “embellishment” as the ocean is deep. Many of Bruce’s stories start with, “One day, down at the plant….” There are more characters I could name but you get the point. Undoubtedly you know a few yourself. Character is earned through hard work and very challenging life experiences. When the Major came out of the Battle of the Bulge during WW II alive he had earned a few stripes, literally and figuratively. No one who ever worked for Josephine Day at the “Ewe” ever left the same as when they arrived. More often than not character is formed, tempered if you will, “under fire”. So that begs the question, how will the up and coming generations find their character. I have been in many sail training situations aboard the schooner with college students and younger adults. More recently I have wondered if young men in particular were going through the moves, looking right for the part but not really grabbing life by the horns and shaking it for all they could. Without having had too much stress in their lives why would they? 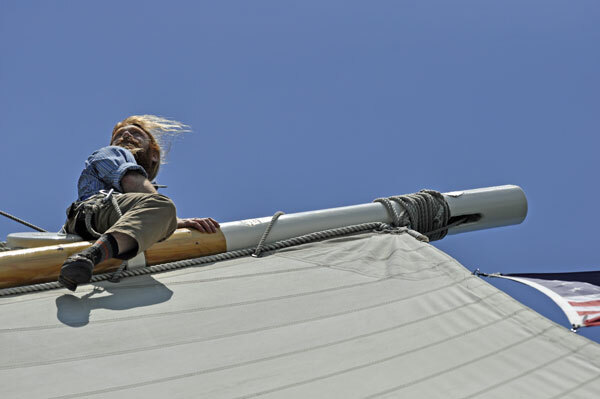 Finding crew for the schooner is a huge challenge these days and the best crew more often than not come from what I consider the strongest families or in the opposite extreme the hardest family situations from which by the grace of God they have emerged self-reliant. Do you know how many 19 year olds we have had arrive at the boat who have never cooked, cleaned, shopped for food, done their own laundry or otherwise had to fend for themselves emotionally, financially or physically? Someone decided to call this Generation Y or “Millenials.” Sociologists have put a pile of labels on these folks. Goodness knows I lacked all sorts of emotional maturity during my 20s, 30s and 40s. Most people wonder about me today. I don’t like labels but what I will say, based on my own experience, is that it is becoming increasingly difficult to find young adults with the strength of character to go the unnoticed extra mile, to stand behind their word when making difficult choices, to put in a long days work without having to stop every half hour for a water break or check their Facebook page. And what is up with young men with bad backs? Don’t get me started!Oooops, too late. At any rate, I am probably sounding like an old geezer by now. That’s OK with me. The point is this. We are looking for a few good men and women who are not afraid of a long days work where back muscles actually get sore, where strength of character is pushed while standing bow watch in the pouring rain, where perseverance is challenged when standing next to a hot wood stove kneading bread in a moving boat with no visible horizon. 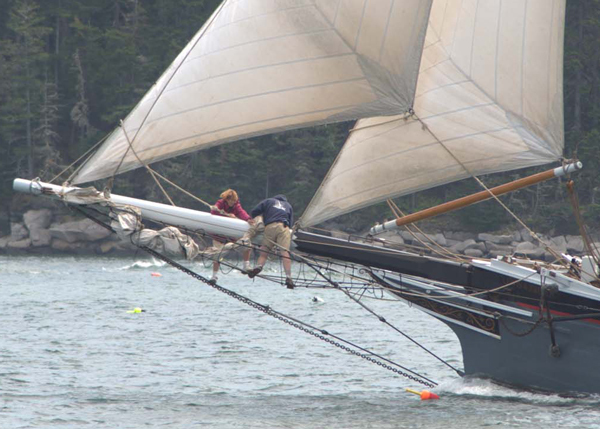 Crewing on a windjammer is not the easiest summer job but it is the coolest. So if you know someone full of the energy and idealism of youth with a strength of character tested by life experience please send them our way. Applications are available online. Posted in camden windjammer cruises sailing vacations on April 7, 2013 by Capt. Barry. Good morning everyone. The past month has been the usual whirlwind of activity here. The tension of fit-out is upon us. I use the word tension with the idea that tension is not always a bad thing but does help me realize where the balance is. Tension, like a spring, keeps things cushioned. 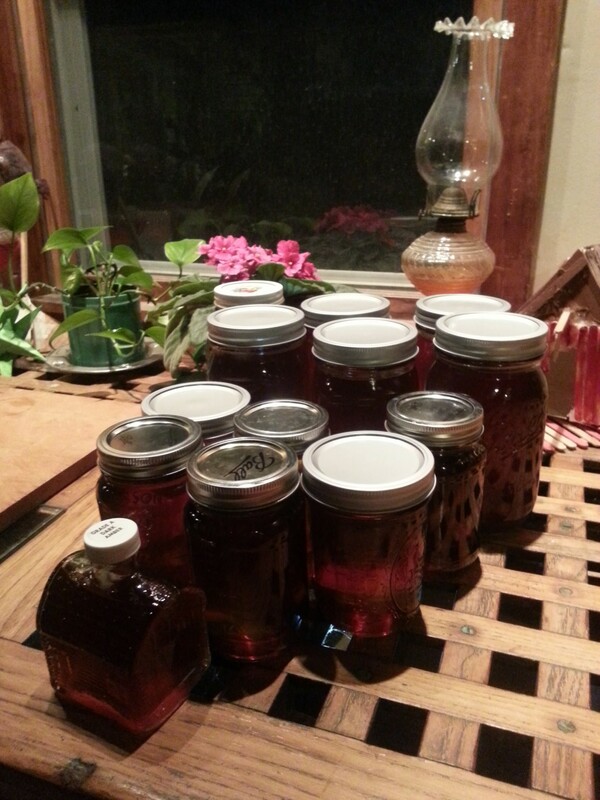 One of this past month’s projects has been tapping the maples and getting some syrup in for the year ahead. The flow of sap from the red maples we tap had one of those off and on years. Tink, tink, tink; the sound sap makes when it drips into an empty bucket on a warm spring day but only after we have had a good freeze through the night. 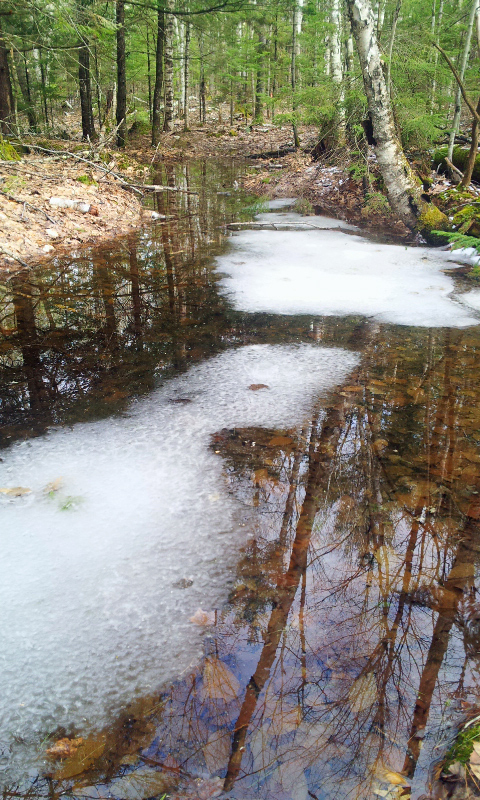 The nights have been getting progressively a little warmer and the sap has pretty much run its course. We finished boiling this weekend. The product is one of the most beautiful amber colored liquids I have seen since the last time we boiled down sap. So for the first 8 reservations we receive for a May or June cruise we offer a free pint of our version of liquid gold made by yours truly from our own maples. How could anyone resist? Hope to see you during one of our glorious early season cruises. Click here for the complete schedule. Have you heard about our new beer tasting cruise, the Craft of Ale Sail? Have a great day. Be well Do good. Posted in camden windjammer cruises sailing vacations and tagged free syrup, Maine maple syrup, maine windjammer, windjammer cruises deals on April 2, 2013 by Capt. Barry.